Drying Machine for Wastewater Treatment – NISHIMURA WORKS Co., Ltd.
Home » Regions of Japan » Kyushu Region » Drying Machine for Wastewater Treatment – NISHIMURA WORKS Co., Ltd.
Company Name: NISHIMURA WORKS Co., Ltd. World-class original products, CD dryer, IB conveyor and various plants are currently issued 15 national patents, 2 international patents in 9 countries and 6 pending applications for national patent, which have export performances in 14 countries and gain a high reputation from home and overseas customers. Machines operating in the world are created in Saga Prefecture. For Japan, the world and the future, the seminal power of Nishimura Iron Works Co., Ltd. has contributed to the world. CD DRYERS belong to the category of conductive heating dryers which indirectly heat and dry materials through conduction. Drum type dryers and cylinder dryers used at paper mills also belong to the same category. 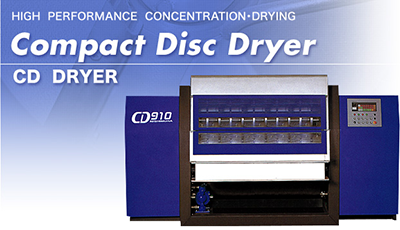 Unlike conventional dryers, the CD DRYERS do not make use of the circumferential surface of its cylindrical drum, but both sides of its hollow disc as conductive surfaces. While developing the CD DRYER, we have made it a basic principle to raise the over-all heat transfer coefficient in designing a high performance dryer with the understanding that dryers are nothing but heat exchangers in principle. Consequently, an evaporation capacity of 200kg/m2h water at 20℃ or over and over-all heat transfer coefficient of 2000kcal/m2h℃ have been achieved. The high performance of the CD DRYER is a revolutionary development for the conductive heating type dryer.